Hypothyroidism - Can It Be Fatal or Severe For Your Health? Hypothyroidism is an endocrine disorder affecting the thyroid gland where the thyroid fails to produce sufficient quantities of hormone. The symptoms that are seen in the patients are mainly due to this hormone deficiency. Thyroid in females is more commonly seen compared to their male counterparts. The anatomy of the thyroid gland is important to understand. Where is the thyroid? It is located in the lower part of the neck in the midline. Hypothyroidism pathophysiology will help you understand how the disease comes up. The hormones produced by the thyroid gland are T3 and T4. These hormones have an action on almost all parts of the body. The secretion of these hormones is regulated by TSH or thyroid stimulating hormone that is secreted by the pituitary gland. The secretion of thyroid hormone occurs only from this particular gland. The presence of iodine and amino acid tyrosine are a must for the production of thyroid hormones. Hypothyroidism and low levels of the thyroid hormones can occur if there is a deficiency of iodine for thyroid or thyroid stimulating hormone(TSH). The hypothalamus of the brain secretes TRH thyroid releasing hormone which acts on the pituitary gland and initiates the release of TSH or thyroid stimulating hormone. TSH then acts directly on the thyroid gland to release thyroid hormones T3 and T4. 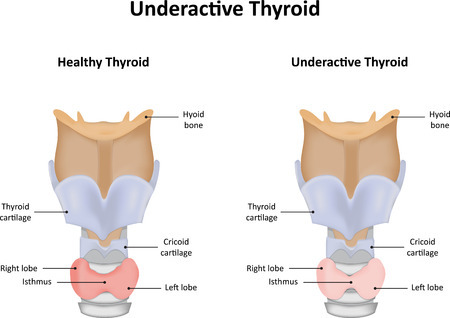 The normal functioning of the thyroid (healthy thyroid) is regulated by negative feedback mechanism where the levels of thyroid hormones increases or decreases under the influence of TSH. The commonest known cause of hypothyroidism is Hashimoto’s thyroiditis which is an autoimmune disorder causing inflammation of the thyroid gland. 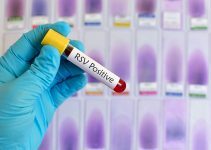 Thyroiditis can also be a part of a viral infection. If the amount of iodine in the diet is less, then the production of the hormones T3 and T4 are affected. The only source of iodine is dietary intake so you must ensure adequate intake. 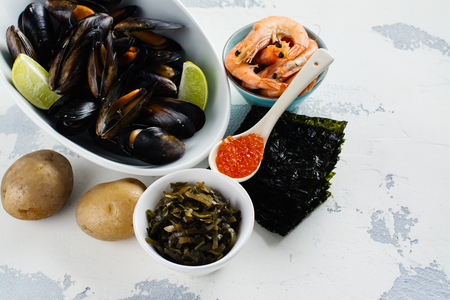 The richest source of iodine is shellfish, eggs, dairy products and iodised salt. Hypothyoidism can occur as a complication of radiation therapy given for cancers of the neck as a result of damage to the cells within the thyroid. Radioactive iodine treatment is given to patients with hyperthyroidism or an overactive thyroid. The radiation can damage the normal cells and result in low production of thyroid hormones and hypothyroidism. Medications that are used to treat certain psychiatric conditions and cancer can affect the normal production of thyroid hormones. Thyroid surgery if performed due to some growth or tumour, can lead to reduction in the quantity of the thyroid hormones and hypothyroidism. The part of the thyroid gland that is left out, will continue to function normally. Hypothyroidism weight gain or difficulty in losing weight. This is most often the first symptom that a female may notice before the disorder is actually detected. Carpal tunnel syndrome due to swelling of the tissues around the wrist. Babies who have hypothyroidism may show the following symptoms like extreme sleepiness, constipation, poor muscle growth or floppy muscles, bloating of the stomach and poor feeding habits. The presence of the above symptoms can raise the doubt of hypothyroidism. The diagnosis is confirmed by blood tests called as thyroid function tests. It tests the levels of T3, T4 and TSH. Hypothyroidism is diagnosed when the levels of T3 and T4 are low and the TSH is raised. In case the TSH levels are normal, it is called as sub clinical hypothyroidism. If there are lumps in the thyroid gland, then diagnostic imaging may be required like thyroid ultrasound, MRI or CT scan. Diagnostic needle biopsy may be needed in some cases. 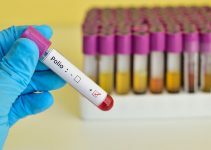 Antibodies against TPO (thyroid peroxidase) are an indication that the thyroid nodule is a result of autoimmune thyroiditis. During pregnancy, the need of the body increases and so a 50% increase in the thyroid production is considered as normal. For a patient with hypothyroidism, the physician or thyroid specialist will prescribe a synthetic T4 hormone preparation. Depending on the severity of the problem, the dose will be adjusted. This pill will be required to be taken everyday early morning on an empty stomach. Whenever you are put on thyroxine medication, it is very important that you tell your doctor what other medications you are taking as they can interfere with the action of thyroxine. Regular thyroid blood test need to be carried out to check the response of the medication. The most accurate indicators of the efficacy of the treatment are free T4 and TSH thyroid test. If the medication is continued for a long time without monitoring, the patient may go into hyperthyroidism stage. Homeopathic remedies for hypothyroidism are also fairly effective in treating the symptoms of the disease. In pregnant ladies who develop hypothyroidism, the levels of TSH need to be closely monitored. In the first trimester, levothyroxine is used in order to keep the TSH levels below 2.5 mIU/L. The levels should be under 3mIU/L in the second and third trimesters. Complications like myxedema coma where the thyroid hormones are at a life threatening low and decompensated hypothyroidism are serious and require intensive care with proper breathing care, temperature control and blood pressure monitoring. Hypothermia or very low body temperature can also cause death. Intravenous administration of levothyroxine is needed in such severe cases. Pregnancy related complications can occur when the pregnant mother get the disorders in the early weeks. For the first three months, the baby receives all the hormones from the mother. So in hypothyroid mothers, the baby has lower than normal levels which can lead to problems like poor mental development. In countries where the problem is endemic, iodine rich foods consumption can prevent the onset of hypothyroidism. WHO has encouraged the use of iodine in salt to ensure that maximum population of any given place gets sufficient amounts of iodine in their diet. Using iodised salt is one of the best natural remedies for thyroid. The recommended levels for pregnant and breast feeding mothers of iodine is 250 ug per day. Screening of pregnant ladies for thyroid is also a way of prevention of hypothyroidism complications in the unborn baby. I’ve never heard of hypothyroidism until stumbling on your article. Great post!